This was the 5th consecutive year of our partnership with Cystic Fibrosis Canada (Vancouver and Lower Mainland Chapter). 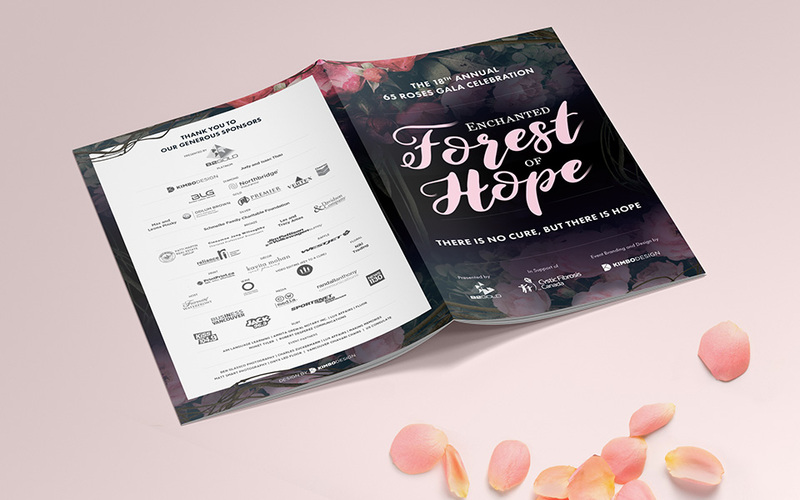 We were commissioned once again to provide event branding, design, and creative strategy services for the organization’s signature annual 65 Roses Gala, which includes the production of collaterals such as logo, invitations, event programme, signage, ads, and various digital assets for social media as well as the event’s digital bidding system. 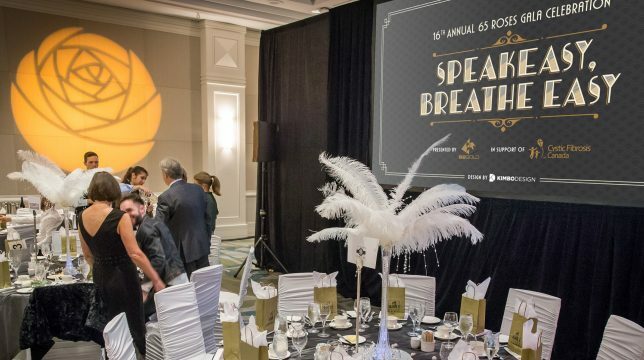 The renowned 65 Roses Gala is British Columbia’s premier fundraising event for cystic fibrosis research, and the KIMBO team once again attended the event in support of this great cause. A total of close to $300,000 was raised in this year’s event, all of which goes towards critical cystic fibrosis research and patient care. 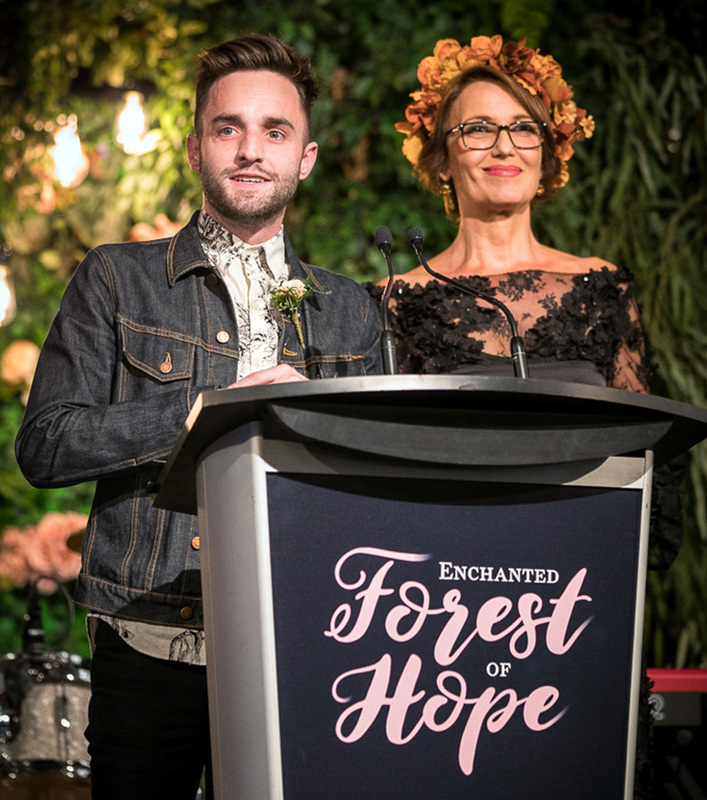 This premier event of Cystic Fibrosis Canada features a different theme every year, with this year’s “Enchanted Forest of Hope” being inspired by forests/gardens. KIMBO was responsible for coming up with a creative concept for the theme. This includes everything from marketing collateral and event materials to visual styling guidelines for the interior design of the actual event. 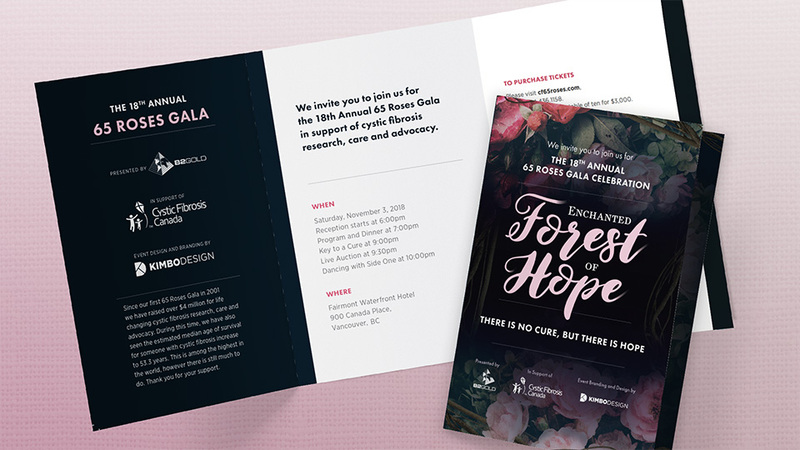 We utilized dark floral imagery with an elegant script to reference the “Enchantment” theme in our designs, with the rose motif being a common thread between all of our work with Cystic Fibrosis Canada in the past. Cystic Fibrosis 2018 65 Roses Gala invitation. 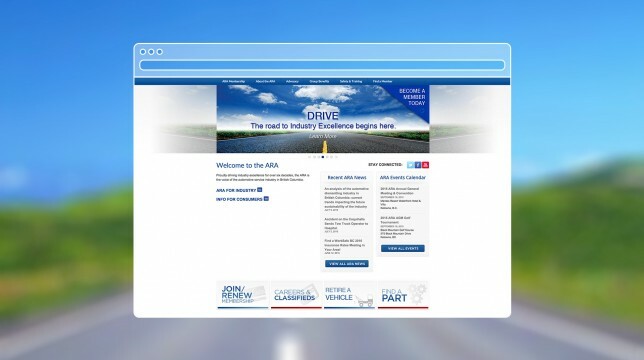 The main challenge to this project was that we had to adapt our design to a multitude of applications. Most prominently, a new tool was introduced this year to allow guests to place bets in the Gala’s silent auction electronically using the “Givergy” app. 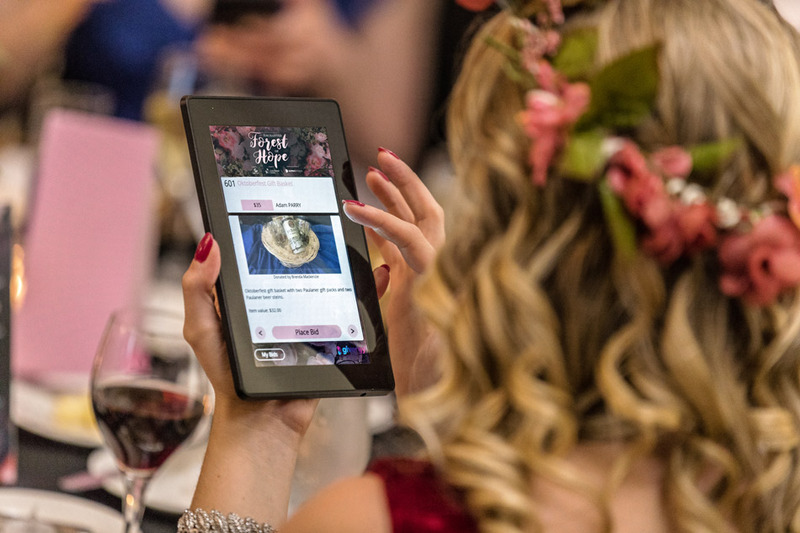 KIMBO created all of the digital assets to be used with the Givery bidding interface so that guests could be fully immersed in the experience of the event, even on their own personal devices such as mobile phones and tablets. 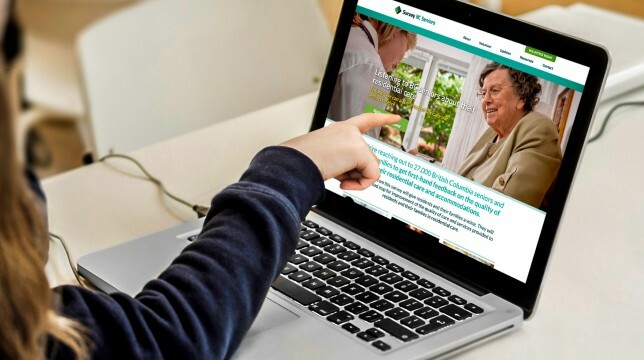 A guest placing a bid using Givergy. We developed a comprehensive brand style guide to ensure that all of the brand assets produced are coordinated and consistent with each other in this project. This guide was incredibly useful in making sure that all elements of the event adhered to the “Enchanted Forest of Hope” theme. 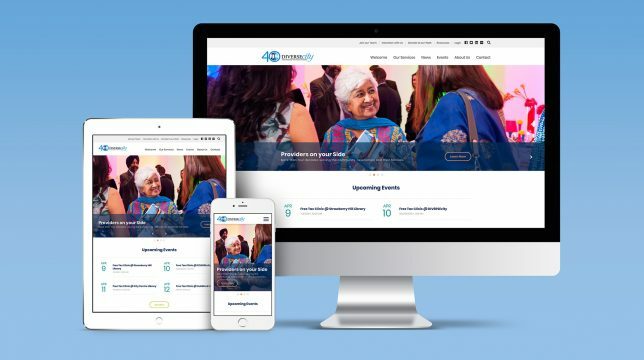 As with previous years, KIMBO delivered an extensive list of custom designed event materials including, but not limited to, invitations, signage, table cards, presentations, programme guides, and silent auction collateral, which consists of a whole new digital portal this year. By utilizing this brand style guide which we developed at the start of the project, we were able to maintain a unified sense of visual identity in all materials produced, tying all of the brand elements together under one umbrella with ease. The event program that was provided to each guest at their table. Cystic Fibrosis 2018 Gala auction table sign. The event hosts, Jeremie Saunders and Gloria Macarenko standing at the podium. This year’s 65 Roses Gala was a huge success once again, raising an impressive amount of $300,00 towards critical cystic fibrosis research and patient care. 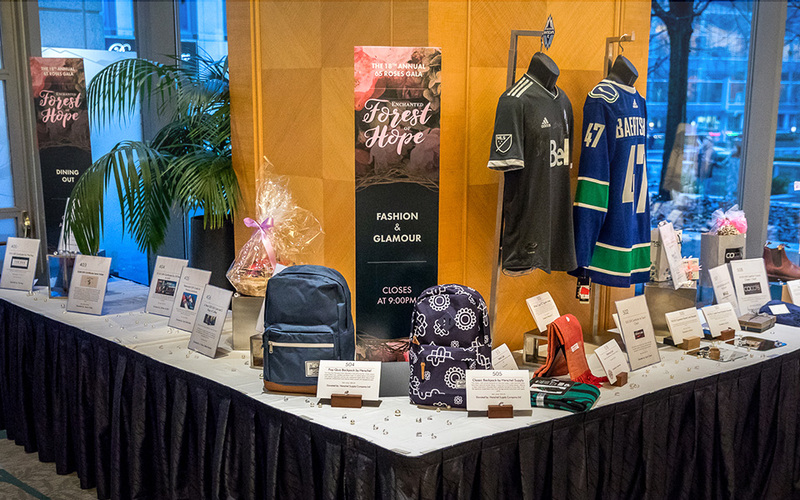 Our designs and artistic influences were showcased throughout the entire event with our work receiving many compliments from guests and the Cystic Fibrosis Canada team alike. As one of British Columbia’s largest fundraisers for the research in cystic fibrosis, we are honoured to have been a part of this journey and we look forward to collaborating with Cystic Fibrosis Canada again in future events.